NOVA CUSTOM T SHIRT PRINTING respects each individual’s right to personal privacy. We will collect and use information through our Web site only in the ways disclosed in this statement. This statement applies solely to information collected at NOVA CUSTOM T SHIRT PRINTING’s Web site. NOVA CUSTOM T SHIRT PRINTING collects information through our Web site at several points. We collect the following information about primary visitors when you fill out a form: Name, contact information. NOVA CUSTOM T SHIRT PRINTING does not actively market to children, and we never knowingly ask a child under 13 to divulge personal information. We collect the following general data that is not personally identifiable information such as where you saw our ad for ad tracking purposes only. We collect this general data information through clickstream tracking, automatic logging files, and so on. We do employ cookies. A cookie is a small text file that our Web server places on a user’s computer hard drive to be a unique identifier. Cookies enable NOVA CUSTOM T SHIRT PRINTING to track usage patterns and deliver customized content to users. Our cookies do not have an expiration date. Our cookies do not collect personally identifiable information. All modern browsers allow you to update cookie preferences. Safari: Preferences -> Security. For more information, please consult Apple’s customer help services, or the Help section of your browser. Internet Explorer: Tools>-> Internet Options -> Privacy -> Settings. For more information, please consult Microsoft’s customer help services, or the Help section of your browser. Firefox: Tools -> Options -> Privacy -> History -> Personalized Setup. For more information, please consult Mozilla’s customer help services, or the Help section of your browser. Chrome: Configuration -> Show advanced options -> Privacy -> Content settings. For more information, please consult Google’s customer help services, or the Help section of your browser. The information collected by NOVA CUSTOM T SHIRT PRINTING will be used to communicate with you on the reports you have requested. Users who provide information may receive future email announcements from us about products, services, and a newsletter. Out of respect for the privacy of our users we present the option to not receive these types of communications. The information we collect will not be used to create customer profiles based on browsing or purchasing history. We will not supplement information collected at our Web site with data from other sources.We will not share data with third parties.We do offer links to other Web sites. Please note: When you click on links to other Web sites, we encourage you to read their privacy policies. Their standards may differ from ours. If our policy on information collection or uses changes, will advise you by email. If problems arise, users may contact NOVA CUSTOM T SHIRT PRINTING by email. We are committed to resolving disputes within a reasonable time period. 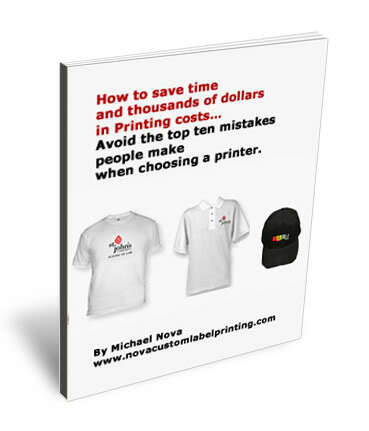 NOVA CUSTOM T SHIRT PRINTING will not sell your information to anyone. Privacy Guaranteed.